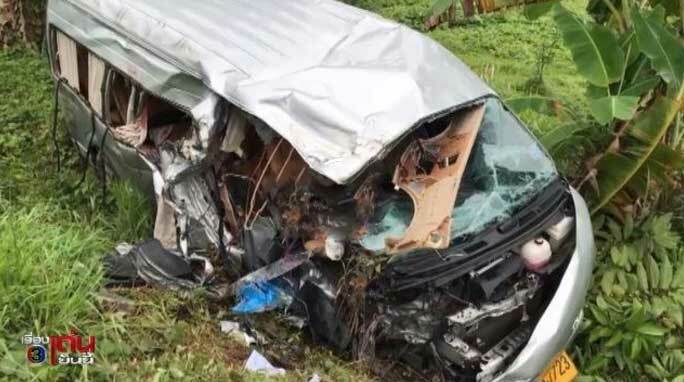 KRABI: -- A foreign tourist and a Thai driver are dead after a van travelling from Krabi airport to Koh Lanta hit a song thaew. The accident happened on the Huay Nam Khao - Koh Klang Road. Initial reports said that seven people were injured - three in the van and four on the other vehicle. All the injured were ferried to Klong Thom hospital. But two have since been reported dead. They were the driver of the van - Sarawuth Suphap - and an unidentified foreign woman. Witnesses said that the two vehicles collided after the van experienced a burst front right tire. The van was taking the tourists from Krabi airport to Koh Lanta. What a way to end your holiday. re ;bald tyres,, on my daily travels, it has amazed me how many scooters and 4 wheeled vehicles i have seen with hardly any tread on the tyres at all. so a bit of rain, and "bang", not saying this is the case for one moment , for the sorry accident. just my observation of general vehicle condition. wow just arrived in krabi airport and then that happens. tourists will be unaware of what death machines those vans are. More carnage on the Thai roads.....It will never stop. RIP for the two dead. Makes you wonder how many lives are being lost every year due to lack of enforcement of the traffic rules and regulations? I would say 90% of the total each year. I would prefer to rent my own car in Krabi instead of driving in the minivan death traps.